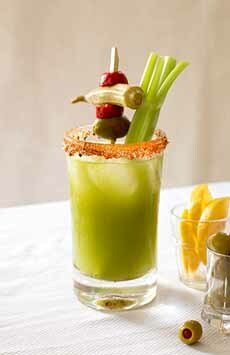 Gearing up for St. Patrick’s Day, we wanted to try a Green Bloody Mary. Yes, can green it up for St. Patricks Day, with the tricks below. The first GBMs of our experience were made with the green tomatoes and yellow tomatoes of August—more legit than this St. Patrick’s Day version, since puréed tomatoes equal the tomato juice of a traditional Bloody Mary. But those tomatoes are around for just a few weeks of the year, and months away from St. Patrick’s Day. 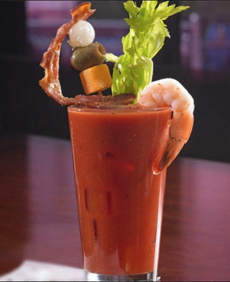 So we went a-looking, and found this recipe from New Orleans bartender Jimmy Syock, who made it as party of the Bloody Mary Bar at Atchafalaya Restaurant. He uses what’s typically a year-round fruit: the tomatillo (yes, it’s a botanical fruit; all about tomatillos). We adapted Jimmy’s recipe a bit, although we kept his party-size measurements. You’ll get 12 Collins glass-size drinks, and more if you use an Old Fashioned/rocks glass. Recipe #2 is a much simpler to make, and just four servings. 1. COMBINE all ingredients except lime juice and salt in a blender; process until smooth. Strain to remove the pulp and any remaining seeds. 2. STIR in the lime juice and add salt to taste. Chill until ready to serve. 3. GARNISH as desired from the list below. We’ve omitted the standard celery stalk and lemon or lime wedge. 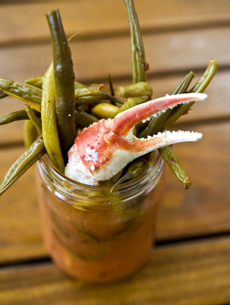 When you go green, you upgrade your garnishes. Fresh veggies: bell pepper circle (sliced horizontally), celery stalk, cucumber or zucchini wheel, dill spear, fennel stalk, rosemary sprig, scallion, yellow cherry or grape tomatoes. Pickled veggies: asparagus, carrot, dill pickle spear, dilly bean (green bean), garlic, gherkin/cornichon, jalapeño, okra, olive, onion, pepadew. Proteins: bacon strip, boiled or grilled shrimp, cheese cubes, crab claw, ham cubes, jerky, mozzarella balls, salami or sausage slices. Rimmers: celery salt or other seasoned salt, dried herbs (thyme, oregano) or a mixture of the two, cracked black pepper with a hint of nutmeg, coarse salt mixed with lime zest, Old Bay (mixed with something else here for a milder taste). 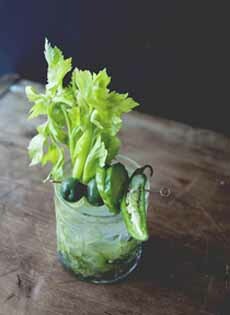 Jimmy Syock’s Tomatillo Bloody Mary, via Garden and Gun. Here’s the recipe from The Kitchy Kitchen, which includes the option of infusing your vodka with vegetables. 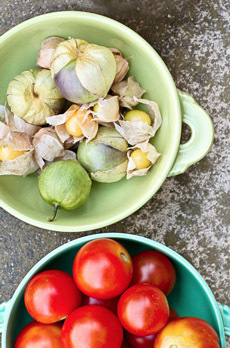 Tomatillos from The Chef’s Garden. You might enjoy putting an “antipasto pick” together with choices from each group; for example, a cheese cube, grape tomato, ham cube, and gherkin. 1. PURÉE the tomatillos and cucumber in a blender or food processor. Add the vodka, horseradish and a few dashes each of green hot sauce and Worcestershire sauce, 1/2 teaspoon celery salt and a pinch of kosher salt. 2. POUR into 4 ice-filled glasses. Garnish and serve. These recipes use traditional red tomato juice, but you can switch to the green blend as you prefer.